Road pedals are not just road pedals, they add grams to the overall bike weight and thus play a role for your overall performance. You might have read about my little experiment to find out how much does extra weight cost on Alpe d’Huez which shows that even small weight savings makes a difference. Thus, it is worth considering bike components’ weights when you spend money next time. All listed weights are Total weight (Pedals incl. cleats). Please note that the links above are all pointing at Amazon which means that Training4cyclists.com receives a small payment if you click the links AND buy your cycling equipment through these links. As I have written previously, every single gram saved is an advantage on the climbs. Naturally it must not negatively effect the riding performance, but I have never heard of a rider having troubles with light weight road pedals. Thus, if you have decided to reduce your bike’s weight, then the above links could be a good place to begin. Nice article! Can you add a column for the cleat weight also? You need to add the two to get the most accurate weight for the combo – it may change a few of the above. I agree about the cleat wts. My speedplay ss pedals (207g) w/ cleats weighed 331g.My zero cleats w screws wt 124g. Proclaimed wt. of keo cleats is 69g. Do the math. Pedal & cleat combo does change. All this is very fine and definitely worth knowing, but what about us cyclists who are struggling with trying to lose weight. When talking about pedals, we are talking about a few grams. When it comes to body weight, you can be talking about many kilos. As someone struggling with the reality of shedding unwanted weight, a few grams weight-saving on pedals fades into insignificance. I am not looking for sympathy but, for those of us trying to get to any kind of competitive weight, slimming-down is a very realistic challenge and weight-saving on equipment is the least of our worries. It may be instructive to consider cost per gramme. 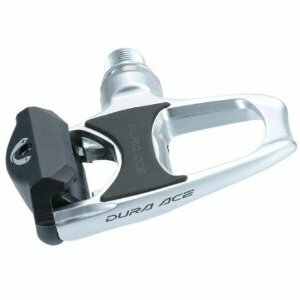 Buying Dura-Ace pedals instead of 105 costs an additional $199, that $4.52 per gramme. You might find better value elsewhere. More importantly, as bikeman54 says, there is no doubt that saving weight off by far the heaviest part of the outfit – the rider – will make the most significant difference of all. Even for already healthy riders we are looking at multiple kilos rather than a few grammes. This requires a little information (plenty of that on the www) but most of all it requires discipline. If you want to shed weight then leave the credit card alone, HTFU and go for it. As a Fitter and a racer, I am far more concerned with the function of the pedal over the weight! Like two others have stated I can lose more meaningful weight and save a boatload of money in the process. While I understand the need for a light bike, the minimal weight savings from a pair of high end pedals does not make up for the price difference. It would be wise to point out that some of these pedals have a rider weight restriction too. Lets focus people on lightening the rider. Hi, the issue of light weight road bike as a whole is every compettive cyclist’s dream. However, from my personal experiences with over ten different road bike from Colombus steel, aluminium alloy, titanium to carbon fibre and over 30 years of riding experiences, let me say/ clarify a few things herein. Although light carbon fibre bike allow faster accelerations and save riding energy, I do found that riding the conventional steel frame give a better momentum and hence a easier effort to maintain riding speed. I don’t have to push all the time to keep up behind the other riders. With heavier paddles rotating the extra weight of the paddle helps to maintain the rotating speed of the crank, that is to say angular momentum. Like a heavy tyre rotate well as slower to stops. Does the above make sense ? light weight wheels, light weight cranks Chainrings & pedals, light weight tubes and tires all make it easier for all different weight riders to spin-up the bicycle speed. Light weight riders will always spend less energy to go faster than a heavier rider, but we are specifically discussing pedals in this thread. A wide solid platform being sufficiently light weight with the cleats used to attach them to your road bicycle shoes and adjustable to fit a few abnormal variances in our feet and lower legs all come into play when deciding on what is the best pedal. The final part of the discussion never discussed: can the be taken apart and serviced easily with easy to find parts without being a master bicycle mechanic, or requiring tossing a squealing pedal. Pedal weight difference is small when compared to shoe weight differences. Careful shopping can save 50-150 grams on a pair of shoes. Lighter does cost more, but shoes last a long time. Of course, fit and comfort come first; but there are many choices. Brands that do not list weights may be doing so because they routinely tend to be heavier.